Cylinder Shape Box for Wine Gift Packaging: made of rigid customized tubes laminated by different kinds of surface paper to build strong construction, inside with EVA insert to protect the wine bottle. It contains three piece of structure which with a border neither on the lid or on the bottom. They can be also luxury looking. Tube Perfume Box with Lid: Tube is paper-made tube-shaped objects. Most paper tubes are spiral paper tubes and seamless paper tubes.The price is a little higher than just greyboard. And it can be used in making tube perfume box,tube wine box and other products packaging. If you need to add printing on the surface of the paper tubes, it’s not able to print directly on the them, but print the wrapping paper firstly, and then laminate it onto the paper tube. We have 2 opinions as offset printing and flexo printing. Offset printing, we print on the laminated paper- always be 250gsm to 400gsm CCNB paper, and glue it onto the paper tube. 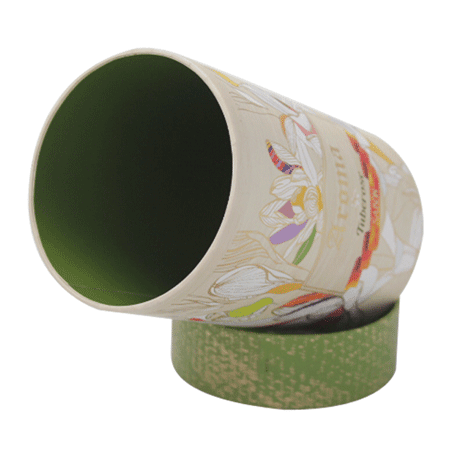 Flexo printing, we always print it on the white Kraft paper or brown Kraft paper and then laminated onto the paper tube.